The standard UNE 23740-1: 2016 Fire Safety. Hollow enclosure elements. Specific requirements for installation, use and maintenance. 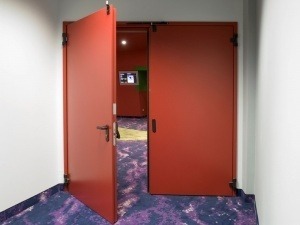 Part 1: Fire doors established requirements for their installation, use and maintenance, which are a fundamental part of the building ‘s fire protection. This standard also describes the documentation that must accompany the door and regulatory requirements for its components. The mission of a fire door is compartmentalize, slow the progression of the fire, allow safe evacuation, and facilitate the rescue and extinction. In order to achieve this, a fire door must be fire resistant, capable of being easily opened to allow the evacuation, and be closed at the time when contacting with fire. And the only way to ensure that a fire door can fulfill its mission is to make a proper installation and regular maintenance provided by trained, experienced and qualified staff. At the same time, the door must be used properly.